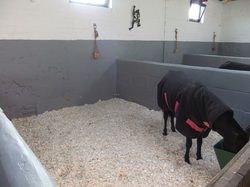 When you find a bedding that lasts 3 times longer than shavings and is cheaper, warmer, more absorbent and softer to lay on then you would be a fool not to use it or a least try it...!! 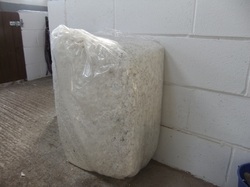 This bedding is like a thick tissue paper incredibly absorbent...it is white so no print...it clumps together and you just remove the clump instead of a big wet patch that you get with Shavings...it is so so soft to walk on almost spongy, there is no amonia smell and one bag lasts me upto 2 weeks and that is being stringent most last longer . 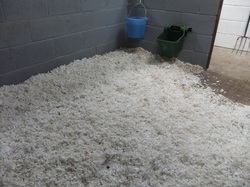 I started with the first bag just putting it on top of my shavings...and slowly changed over that way....I can honestly say it is wonderful...I have used Shavings for the last 33 years, I have tried other bedding and found the horses either eat it or it is not as good as it says or it cost more . 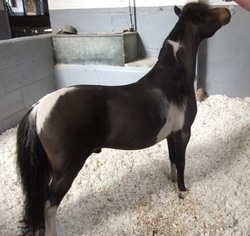 I have always gone back to shavings.. I am in no way making any profit from this. It is Just a great product worth sharing with equine minded people.